As soon as your enter our office, you’ll smile. 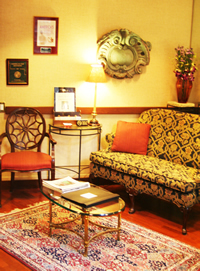 Our cheerful waiting room is warm, cozy and comfortable. It is centrally located in the Helmsley Buildingin midtown Manhattan. On Park Avenue at 46th Street and across the street from Grand Central Terminal, it’s easy to get to and from via public and private transportation. Our office was recently featured in Dental Economics, a world renowned publication for all dental professionals, as Office of The Month! Dr. Jan Linhart and Dr. Zachary Linhart, who both focus on Cosmetic and Restorative Dentistry, maintain an outstanding full-service operation in all levels of general and specialized dentistry. They perform routine checkups, simple fillings and professional cleanings as well as Periodontal therapy, root canals, implants and crowns. The clientele includes many prominent personalities, models and corporate executives; even international travelers seek out his services when they’re in The Big Apple. Sophisticated Anesthetics: The Wand makes the discomfort of anesthesia injections disappear. Digital X-Rays emits the lowest radiation exposure. Advanced Computer Imaging System gives you a photograph of what your smile looks like before treatment and a sneak preview of how it will look after. The after image can be adjusted until it’s exactly what you want. E4D Cad-Cam system allows Same-Day crowns, inlays, and onlays! All designed to provide you with the best possible treatment in the most comfortable setting. That means when you leave Dr. Linhart’s office, just like when you entered, you’ll have a beautiful smile on your face; but it will be bigger, brighter and better than before!